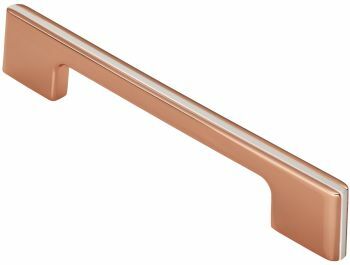 Copper finish Harris cupboard handle, available in 128mm, 160mm & 192mm centre to centre fixings. The slender 9mm wide handle is square along its length forming into substantial end mounts. A white coloured inlay is inset around the central circumference offsetting the finish of the handle and providing a pleasing contrast. The attention to detail reflects the high quality and production standards invested in this pull. 128mm fixing centres, 155mm overall length, 26mm projection. 160mm fixing centres, 186mm overall length, 26mm projection. 192mm fixing centres, 219mm overall length, 26mm projection.